Cabernet Franc lovers always seem to find one another. I’ve also found over the years that those who make the Cabernet Francs I enjoy most — from any region — tend to be fellow franc fanatics. As such, I guess it’s not really surprising that Jake Busching, owner and winemaker at Jake Busching Wines, and I became fast Facebook friends (we haven’t met face-to-face yet) — and that his 2015 Cabernet Franc was the best Virginia Cabernet Franc I tasted in 2017. 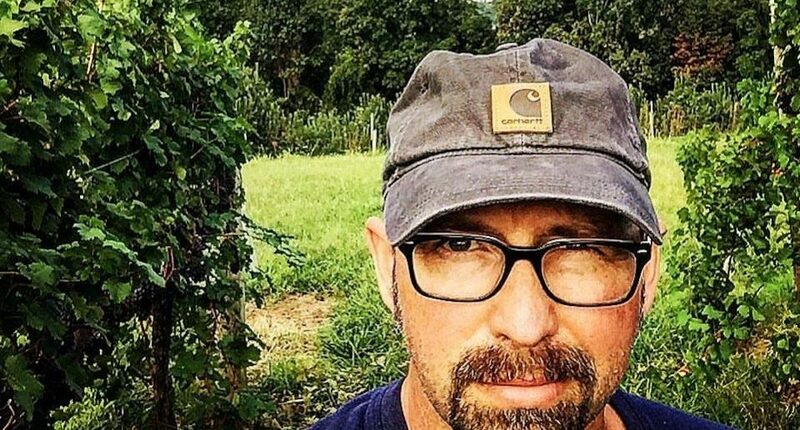 He’s also a great follow on Instagram if you’re interested in Virginia viticulture, Virginia wine and the good life — including being a dad to two boys. 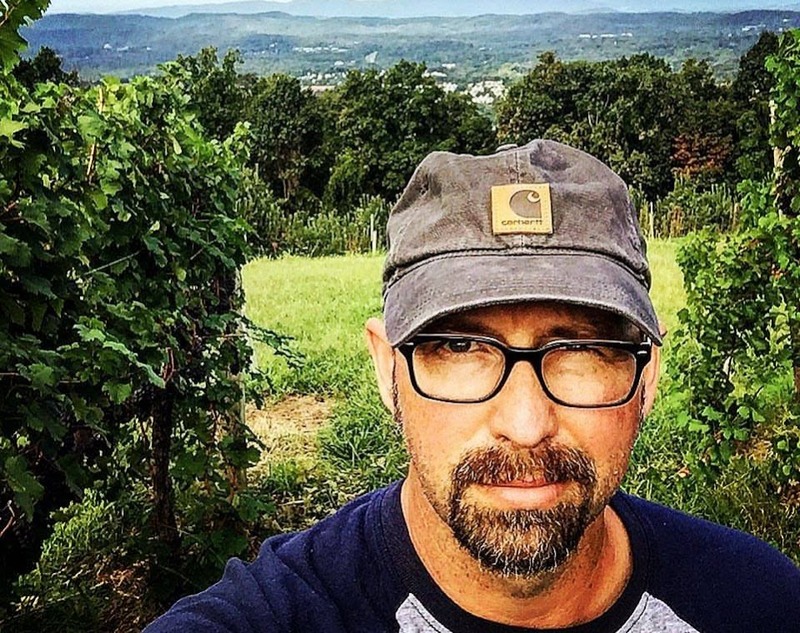 From growing grapes to making wine to running wineries of varying size and persuasion — Jake has broad and deep experience in the Virginia wine industry and he’s now applying that to his own label. 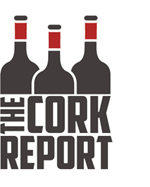 At a tasting of nearly two dozen East Coast Cabernet Francs last year, that 2015 Cabernet Franc was a welcome beacon of varietal correctness and restraint in a category too often marred by too much oak influence and overripeness. Title: Owner & Winemaker for Jake Busching Wines and consultant as Jake Busching and Associates. Before I Became a Winemaker: Before I found the wine industry I was adrift as a musician with a degree in Electronic Music Technology, spent time as a technician for a fiber optic company, was a rug salesman and … then I stumbled into a vineyard when I was 27 years old. How I Ended Up at Jake Busching Wines: The trail of related work starts in 1997 at Jefferson Vineyards near Charlottesville, VA where I became vineyard manager over a four-year work study with Chris Hill and Michael Shaps. In 2001, I went on to work briefly for Horton Vineyards before starting in at Keswick Vineyards. I spent three years building that project and learning serious viticulture before moving on to Pollak Vineyards. The Pollaks and I designed and built the entire project from the ground up. It’s where I cut my teeth making high-quality wine and learning everything from serious dirt work under 25 acres of vinifera to general managing a 6,000-case estate winery business. In 2011 I was asked to build another project in the AVA which is now Grace Estate Winery in Crozet. There I developed the estate into a 60-acre vineyard and a 4,000-case winery. This is where I learned commercial grape growing and the nature of what AVA grapes are all about — communal dirt expression. In 2015 my first mentor, Michael Shaps, called and asked me to work for him at his 25,000-case custom crush facility, so I moved into the lead winemaking roll for Michael Shaps Wineworks. We began streamlining that business over the following couple of years which saw me move into a consulting role for both winemaking and vineyard management. Consulting, and building my private brand, is what I am now doing for and in the Monticello AVA for both vineyards and wineries. What I’m Drinking Right Now: As I type, I am enjoying a 2015 Couly-Duthiel Chinon Les Gravieres, from Loire. I am a huge fan of Cabernet Franc and will always be a voice for the grape in Virginia. The First Bottle of Wine I Remember Drinking: I was coming off shift from a hotel restaurant in Richmond, VA in 1994 at midnight, walked into a 7-11 and bought a bottle of some Chianti for around $7. This was honestly my first step onto the wine path. My first memorable bottle of Virginia wine was the 1997 Cabernet Franc from Jefferson Vineyards. It was the first wine I had a part in growing and I was hooked from that day forward. My Winemaking Style: Stylistically I like to think of myself as a winegrower. Admittedly, I have a red wine maker’s hand and my wines tend to be extracted as opposed to elegant, I’d say. Dirt belongs in the bottle. It’s the heart of the wine. The Music Playing in the Cellar Right Now: Every vintage has a soundtrack for me. For instance, 2017 was wine podcasts and Pandora station jazz and a whole lot of The Black Keys. 2013 was Tool, A Perfect Circle and Fugazi. 2010 was Medeski, Martin, and Wood. 2007 was Red Hot Chili Peppers Stadium Arcadium and Foo Fighters. Music and wine go very well together in my head and my tastes for both tend to evolve with life around me. My Favorite Thing About the Virginia Wine Industry: Easily the best thing about our AVA is the sense of community and cast of characters continuing to raise the bar for everyone. Some of my best friends are transplants that landed here in wine work from afar. What I Wish Was Different About Virginia Wine: I’d like to see more education taking place at a local level that would enable young people to get into the business. There’s an effort being made but we need to start training programs that have a better hands-on aspect. On a Random Thursday Evening, You’ll Find Me Drinking: There is a wine-buying guild here in Charlottesville. I buy a great many bottles of random wine from them. So it really could be anything, but it’s usually wine that will teach me something or reflect a region I am interested in. My most random recent wine was a Saperavi from the Finger Lakes. Amazing wine. Thank you, Dr. Konstantin Frank! My Last Meal on Earth: I think that I would choose to cook a meal with a few select people and share some choice bottles from the dusty parts of their cellars. The community of wine is my favorite part! Conversely… I’d go ask to be fed five courses at chef Tucker Yoder’s table with a bottle of 2005 Saumur Champigny Cabernet Franc from Thierry Germain. That man makes Cabernet Franc simply perfectly.